The majority of SAT takers in the class of 2016 took the old SAT, which was last administered in January 2016. However, some may have taken the new SAT, first administered in March 2016, before graduating. The total number of students in the class of 2016 who took the old SAT at least once through its last administration in January 2016, along with a comparison to the number of students in the class of 2015 who took the old SAT at least once through January 2015. Performance data for the class of 2016 include mean scores for students who took the old SAT at least once through January 2016. We also provide, for comparison, the mean scores of students in the class of 2015 who took the old SAT at least once through January 2015. We will return to presenting SAT data for the traditional graduating cohort in next year’s results. The class of 2017 will be the first cohort when most graduating seniors will have taken the new SAT, and that will become the new baseline to which we will compare future results. The redesigned tests are new tests based on different specifications than the old tests. While the majority of students in the class of 2016 took the old SAT, some took the new SAT. The way we collect and report race and ethnicity data has changed. We changed our data systems to support our new score-reporting portal and to better align to school, district, and state data systems. 1,681,134 students in the class of 2016 took the SAT—either the new or old—at least once through June 2016. This is compared to 1,655,557 students in the class of 2015 who took the SAT at least once through June 2015. Note: The published number for the class of 2015 is different than what we provided in last year’s SAT results for the class of 2015. Learn more about the new graduating cohort calculation. The published number for the class of 2016 reflects information as of August 26. 1,637,589 students in the class of 2016 took the old SAT at least once through its last administration in January 2016, compared to 1,626,816 students in the class of 2015 taking the old SAT at least once through the comparable period in 2015. The data shown below for the class of 2016 include mean scores for students who took the old SAT at least once through January 2016. We also provide, for comparison, the mean scores of students in the class of 2015 who took the old SAT at least once through January 2015. Mean scores for the class of 2016 are slightly lower than those of the class of 2015. While we don’t know the exact reason for the slight difference in mean scores, we do know that in the past several years, more and more districts are offering the SAT to their students for free during the school day, resulting in a broader spectrum of preparation among test takers. Next year, there will be more states and districts using the SAT than ever before. The SAT is accepted by all U.S. colleges. Colleges and universities use SAT scores in a variety of ways, including for admission consideration, course placement, academic counseling, and scholarship and merit aid distribution. Research on test validity shows that, when SAT scores and high school grades are used together, they are the most powerful predictor of college readiness for all students. This year, we completed a pilot predictive validity study that found that the new SAT continues to predict first-year success in college just as well as high school GPA, and that looking at SAT scores in conjunction with high school GPA remains the best predictor overall. Research shows that grade inflation is making it harder to show distinctions in student achievement using high school GPA alone. More students are earning the same high school GPAs. The variation in high school GPA has decreased by nearly 10% between 1998 and 2016. Among students with combined old SAT scores of 1300 or higher, variation has decreased by almost 30%. 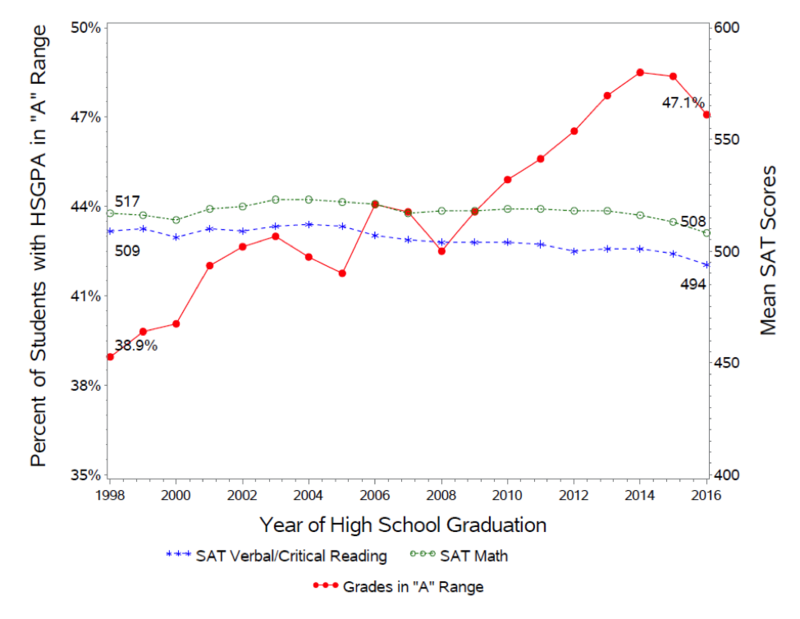 This is evidenced by the growing fraction of students reporting high school GPAs in the A range, which has increased from 39% in the late 1990s to 47% in 2016, as shown below. Note: The new SAT was first administered in March 2016. For comparability, only students who last took the old SAT in January of their high school senior years (or earlier) are included. GPAs have risen while SAT scores have not. Since the late 1990s, the average high school GPA of SAT takers has increased from 3.27 to about 3.38. This grade inflation is evident in data collected by the College Board and in administrative data collected by the U.S. Department of Education. 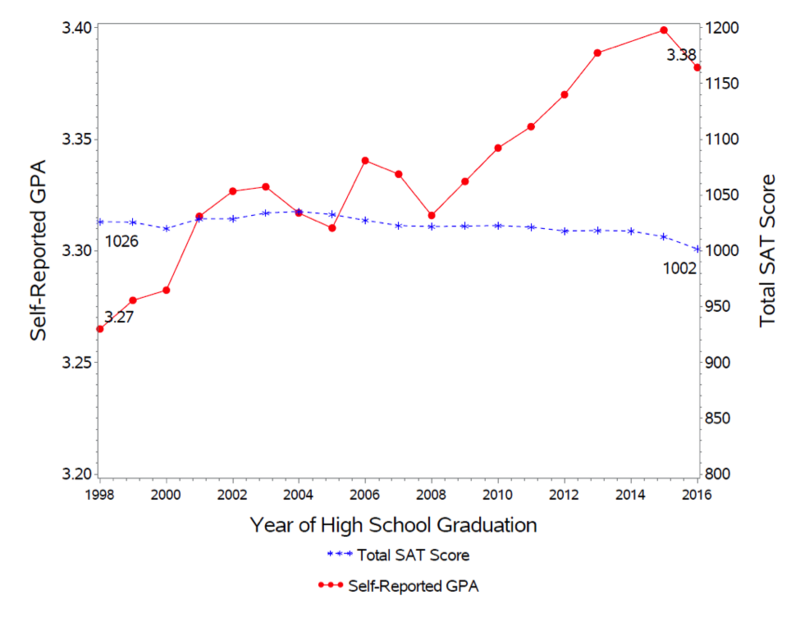 SAT scores have declined slightly over this period—a trend that runs counter to the increase in average high school GPAs. Need more information? Email us.